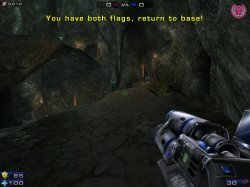 Chaos Capture the Flag has the same basic concept as normal CTF. Your team can only score by capturing the enemy flag and bringing it back to your flag, at your flag base. The main difference in Chaos CTF is that when an enemy flag carrier has dropped your flag somewhere in the map, you cannot simply touch it and have it automatically returned to your base. In Chaos CTF, you must actually pick up your dropped flag and carry it back to your base! You can even carry both flags at once if needed. So if you already have one flag on your back when you find the other flag, you can pick it up too and carry both of them back to your base at the same time. You will score when you touch your flag stand with both flags. 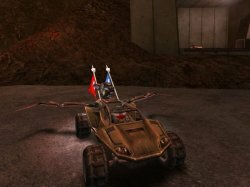 Chaos CTF supports maps with vehicles, as well as normal CTF maps! When you select the Chaos CTF game type, all CTF and vCTF maps you have installed will show up in your map list. This allows you to quickly and easily set up a mixture of all your favorite vehicle maps, and non-vehicle maps, in the same rotation. Chaos CTF can even be played on non-Chaos maps! 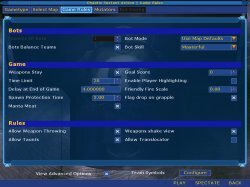 You are free to choose any of your CTF and/or vCTF maps when playing Chaos CTF. 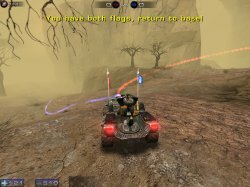 You can play on all the standard UT2004 maps, and even your favorite user-made maps as well. 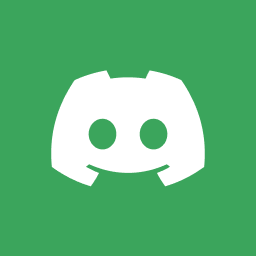 Chaos CTF has bot support! The bots understand the “return your flag” rules of Chaos CTF, so if you enjoy offline games, they’re ready for you. 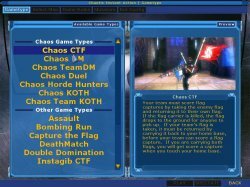 Once Chaos is loaded, and you’ve selected Instant Action from the main menu, you will see the game types menu, and from here you can select Chaos CTF. Then hit the Select Map tab, and all the CTF and vCTF maps that you have installed will automatically be displayed (both Chaos and non-Chaos maps will be listed). 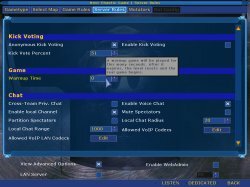 If you are starting a Chaos CTF server, there is a WarmUp setting under the Server Rules tab. If you set a WarmUp period, players will be able to move and even frag each other, but the flags cannot be picked up. Of course any and all points that are gained in warmup are erased when the actual match starts. This warmup period is of course optional, and perhaps is most useful when attempting to set up organized matches. Manta Meat – If this is On, players who attempt to ride on the wings of a Manta will be gibbed by it’s fans! Flag Drop on Grapple – If you turn this off, players will be able to use the grappling hook – and carry the flags at the same time! Allow Translocators – This is not a new option, we have simply increased it’s power. In Chaos CTF, if you turn this Off, it will also remove any translocators that were placed as pickups in a map. 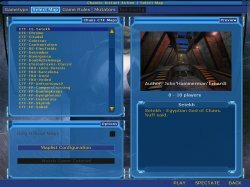 So that players and/or admins who choose to play Chaos CTF without translocators, can do so regardless of which map they use. 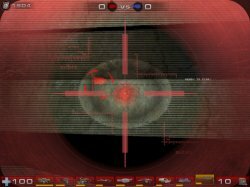 IMPORTANT: When playing Chaos CTF, the ‘radar dots’ in the top center of your HUD will always point to the flags themselves, and not the flag bases! In normal CTF, those little dots up there usually point to the flag bases in CTF maps. However, in Chaos CTF it is much more important to be able to find both flags at all times, so just get used to following the dots, and you will find the flags. Also, to avoid confusion, each radar dot will go away when you are the one carrying the flag it represents. Just as in regular CTF, there is an exclamation point ( ! ) that flashes over the flag icons to alert you when somebody has picked up a flag…. and since in Chaos CTF it could be either team that has either flag – the exclamation points will always be color coded, allowing you to know at a glance exactly which team is carrying which flag. 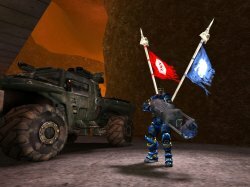 In this example to the left, you can see that the Blue team has both flags. In addition, we have tweaked the HUD text messages to allow for the various situations you’ll find in Chaos CTF. As in this example to the right, where you are carrying both flags. Now, this part isn’t actually a change that we made, but just a reminder…, if you ever get lost, you can still use the BasePath keys to spawn a light that travels towards the red and/or blue base, just as in regular CTF. So as you can see in this pic, tapping on the BasePath keys for a couple seconds shows clearly which way to go to get to either base. The Basepath keys can be bound in your normal configs menu. When using the Chaos Sniper Rifle in a game of Chaos CTF, the enhanced scope (hit AWO key to toggle on and off) will have an additional ‘FlagFinder’ indicator just for the Red and Blue flags themselves, whether they are being carried or not. And just like the LST system of the Chaos Sniper Rifle (see weapons page for details) these FlagFinders even work thru walls. This is just another tool to allow players to keep track of the flags at all times, and keep the action moving. – If a flag is dropped into areas like lava or outer space, it will not be automaticaly returned to it’s flag base. Instead the Chaos code will attempt to return the flag to as close to where it left the playable area as possible, though it’s not always exact. Remember, always follow the radar dots to find the flags. – You can bind a key in the Chaos menus for ‘Drop Flag’, so that you can toss any flag(s) that you are carrying to a teammate, if needed. See configs page for details on keybinds.